The growth of social media as a primary and often preferred news source has contributed to the rapid dissemination of information about volcanic eruptions and potential volcanic crises as an eruption begins. Information about volcanic activity comes from a variety of sources: news organisations, emergency management personnel, individuals (both public and official), and volcano monitoring agencies. Once posted, this information is easily shared, increasing the reach to a much broader population than the original audience. The onset and popularity of social media as a vehicle for eruption information dissemination has presented many benefits as well as challenges, and points towards a need for a more unified system for information. This includes volcano observatories using social media as an official channel to distribute activity statements, forecasts, and predictions on social media, in addition to the archiving of images and other information. This chapter looks at two examples of projects that collect/disseminate information regarding volcanic crises and eruptive activity utilizing social media sources. Based on those examples, recommendations are made to volcano observatories in relation to the use of social media as a two-way communication tool. These recommendations include using social media as a two-way dialogue to communicate and receive information directly from the public and other sources, stating that the social media account is from an official source, and posting types of information that the public are seeking such as images, videos, and figures. Public interest in volcanic eruptions is high, especially on social media. Social media is simply social conversation through web-based platforms, encompassing a variety of examples including social networking platforms (e.g. Twitter, Facebook), media sharing platforms (e.g. YouTube, Instagram), crowdsourcing platforms (e.g. Ushahidi, Crisismappers), and others such as blogs, discussion forums, chat rooms, wikis, and apps. Social media not only allows critical information to be disseminated but also publicly discussed; it provides an opportunity for concerned individuals to communicate related issues, express attitudes and share knowledge and experiences of events through stories, photographs, and video. As such, officials use social media to collect data from people affected by volcanic eruptions (e.g. Carranza Tresold 2013). However, information shared on social media is often not clearly organized and can cause confusion; it may not always be accurate and the sources can be difficult to identify. Nevertheless, as a two-way communication tool, social media give official agencies and the public an opportunity to dispel rumours circulating via social media and other media sources (Bird et al. 2012; Bruns et al. 2012). Where traditional news sources often sensationalize a volcanic event and provide very little follow-through, social media can be used as a means for community connection and support after an event, or for preparedness in times of quiescence. Despite the obvious benefits, many official agencies, including most volcano observatories, lack guidelines on how to use these cost-effective communication tools to their full potential (Disaster Management SofS Working Group 2014; Dufty 2015) and have not integrated social media into their core communications strategy. There is a wealth of information disseminated every minute via social media platforms. However, many agencies are unsure about the best methods for capitalizing on this valuable resource. Users want the most up-to-date and accurate information about on-going volcanic eruptions and they want it rapidly and to be easily accessible. Volcano observatories that do use social media, especially to post official information, images, and data from eruptions tend to have a large group of followers (in excess of 10,000), which includes bloggers and traditional media. We provide examples of two projects that require collecting and then disseminating information regarding volcanic crises and eruptive activity: the Weekly Volcanic Activity Report, a joint product of the Smithsonian Institution and the U.S. Geological Survey (USGS) (http://www.volcano.si.edu/reports_weekly.cfm) written by one the authors (Sennert); and, ‘Eruptions’, a blog written by another of the authors (Klemetti) (www.wired.com/category/eruptions/). We do not offer a comprehensive look at the use of social media in all aspects of crisis communication; instead, we look at the use of social media by these two projects and offer a set of recommendations for that usage by volcano observatories and other official agencies. The Smithsonian Institution’s Global Volcanism Program (GVP) and the US Geological Survey’s Volcano Hazard Program collaborate to produce the Weekly Volcanic Activity Report (WVAR), which summarizes new and on-going volcanic activity globally. It is posted on the GVP website every Wednesday and is widely redistributed online. WVAR was created for timelier reporting of volcanic activity on a global scale and quickly began serving the needs of humanitarian response agencies, military commands, travellers, businesses, scientists, and the general public. It has become a very popular site because it gives readers a snapshot of worldwide eruptive activity and unrest in one place. On average, WVAR received about 21,900 page views from 7620 unique visitors per week in 2014, with increased usage surrounding notable eruptions. Since its inaugural issue in November 2000 through the end of 2014, the regular, consistent, and thorough reporting has resulted in 10,575 individual summaries included in almost 740 weekly reports on over 270 volcanoes. WVAR aims to include all volcanic activity that occurred on Earth during the week leading up to its online publication. About 20 sub-aerial volcanoes are erupting at any given time (Siebert et al. 2010). Some of the criteria considered in the report-generating process include: raising or lowering of the hazard status; the release of a volcanic ash advisory by a Volcanic Ash Advisory Centre (VAAC); and/or, a verifiable report of new or changing activity as noted in the media or by observers. It is important to note that volcanic activity meeting one or more of these criteria may occur during the week, but may not be included in the WVAR because details about the event were not available. In addition, more than a dozen volcanoes globally have displayed more-or-less continuous eruptive activity for decades or longer, and such routine activity is typically reported on a monthly basis unless a special report is issued. The core of the WVAR process consists of rapid information gathering, data evaluation, and summarization. The WVAR editor has relied heavily on combing through electronic information channels such as the official websites of volcano observatories. Some observatories that do not have an on-line presence may distribute activity bulletins through email. To obtain primary source data, around 40 trusted websites are visited almost daily, including observatories, Volcanic Ash Advisory Centres (VAACs), civil protection agencies, and meteorological offices. The majority of the websites (29) are volcano observatories, and are visited first (along with two additional meteorological offices) for accurate and up-to-date eruption information. Therefore the content and reliability of each WVAR depends heavily on the accuracy and timeliness of reports posted to these observatory websites. In cases where an eruption occurs from a volcano that is poorly or not regularly monitored, or a larger event occurs, the information search is expanded to any and ideally all available sources, including social networking platforms, satellite image analysts, gas emission experts, marine biologists, etc. Eruption information from these more transient sources will likely be included if that is the only source of information and/or the source is deemed credible. 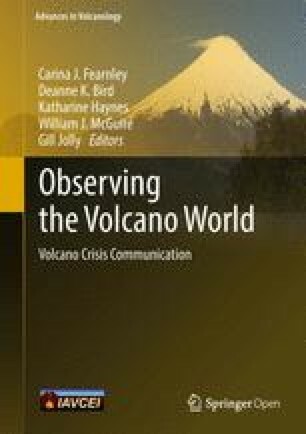 One of the challenges in assessing the state of world-wide volcanic activity in any given week is managing the amount of information available to a user; for just one volcano the source data may be just a sentence or two to well over 100 pages for large events covered by multiple sources. Therefore the greatest disadvantage posed by social media is the additional glut of unedited information. This includes posts from official sources and amateur volcanologists (e.g. a traveller captures an eruption with their phone camera as they pass by on an airplane and instantaneously uploads it). But how much real and accurate information can we glean from an explosion of details on so many platforms from official and amateur sources? Sifting through thousands of Twitter posts, for example, from official and non-official sources about an eruption is prohibitively time-consuming. Moreover, the information can be: (1) difficult to verify; (2) repetitive; (3) transient/ephemeral; (4) not archived; and, (5) not always searchable. A user needs to know where to go for the correct information; events can be missed if one incorrectly assumes that a lack of information on an observatory page means that no volcanic events are occurring. The greatest advantage to social media comes when those platforms are the only sources of information about an eruption, or provide additional and critical details of the event. Therefore, the WVAR editor seeks eruption information from various social media platforms such as Facebook, Twitter, Flickr, blogs, and YouTube. In several instances over the past few years, the WVAR has sourced critical information not just about large and/or sensational eruptions [e.g. Eyjafjallajökull (2010), Merapi (2010), and Sinabung (2013)], or more unusual events [e.g. Kverkfjöll (2013)], but also about regularly erupting volcanoes (e.g. Sheveluch and Etna), from sometimes chance encounters with social media posts. In one case, details of an explosion including photographs were garnered from a social media connection with an observatory scientist; the details were not shared on the official observatory website until a later date. In a second case, the WVAR editor sourced volcanic activity information after being directed to an official civil protection Facebook page from a travel blog. The official website had a very brief summary of the event but more comprehensive information (written details, dates, pictures, and an over-flight video) about the event was gleaned through a Facebook page. However, due to the blog-style of Facebook and lack of sufficient data-searching capabilities and archiving, it was difficult and time consuming to revisit the post a few days later to ensure all relevant information had been collected. Despite this, the Facebook posts yielded a better understanding of the event and allowed a more accurate summary of the eruption. Again important details of the event were discovered by chance and could have easily been missed; the official civil protection website did not offer the same details. Since timely information about eruptions can be crucial to humanitarian efforts, scientists, report writers, and a variety of other users, it is critical that observatories establish reliable channels for the dissemination of eruption information. The two examples described above expose challenges in using social media as a source for information: when are social media sites complimentary to observatory websites and when are they supplementary? Anecdotal evidence suggests that observatory representatives have varying perceptions of social media: some view the extra effort as a burden and therefore post randomly and sparingly while others prefer to post on social media rather than through the observatory website. This highlights the need for observatories to clarify how their information is disseminated to stakeholders so that users know where to go first for official, accurate, timely, consistent, and archived eruption information. An October 2014 examination of 33 observatory, meteorological office, and civil protection websites showed that all but three provided another means of information distribution, in addition to the official observatory website, by way of links on the website. These include social networking platforms, email distribution lists, and news feeds. Regarding social networking platforms, almost half the observatories use Facebook (48 %) and Twitter (42 %), followed by YouTube (24 %), Google+ and Google Groups (15 %), photo sharing sites (6 %), and one link to Pinterest (3 %). Email distribution lists accounts for 39 and 18 % use RSS/CAP feeds. For the most part links to these other outlets were visible somewhere on the main page, although not all were easily found, and a few were embedded on sub-pages. Two additional observatories use Twitter (Table 1, data for volcano observatories, monitoring agencies or emergency management groups that utilize Twitter) but do not obviously link to their Twitter accounts from their websites so were not included in this tally. Clearly most observatories are utilising social media, but how and to what degree varies. ‘Eruptions’ blog is one of the most popular sources for information on volcanic activity on social media. Information is gathered for ‘Eruptions’ via filtered Google News reports, Twitter, and volcano observatory websites. Readers also leave comments with information of on-going eruptive activity gleaned via traditional news sources, blogs written by amateur enthusiasts, and observations of volcano webcams. Since its inception in May 2008, the ‘Eruptions’ blog has received over 5 million visits and from 1 May 2012 to 1 May 2013, the blog had 1.978 million page views. This traffic shows the strong interest in volcanology by the general public and the demand for accurate, scientific information on current activity worldwide along with research in volcanology. A Twitter account (@eruptionsblog) is partially linked to the blog. This account has over 8750 followers (as of 18 November 2014) and is primarily used to tweet information about new and on-going eruptions, both from material produced for the blog and from outside sources. Twitter is one of the primary sources for information published on ‘Eruptions’. Whenever a new eruption occurs, Twitter is one of the first places where images of the activity can be found, typically taken by the general public on their phones or digital cameras. Local media reports often appear on Twitter soon after an eruption has begun, typically much faster than they will appear in a Google News search for the volcano or region (especially if it is not in English). Crowdsourcing data on volcanic activity or via citizen science activities during volcanic eruptions has been attempted on a number of platforms (Klemetti 2010), such as Twitter, Flickr, and Instagram. For example, Pyle and Oxford University’s Earth Sciences Class of 2015 (2014) used data gleaned from a variety of social media platforms along with published photographs of the area to estimate the ash fall for the February 2014 eruption of Kelut in Indonesia. They found exponential decay of ash away from the volcano that was similar but larger than that from Kelut’s 1990 eruption. This suggests that collecting ash fall information from social media might be a quick way to calculate the magnitude of the eruption without sending experts to different locations around the volcano or to get information from officials during a time of crisis. The most effective Twitter accounts from volcano monitoring agencies release the following types of information through their primary account: images of eruptions, links to official releases about the on-going activity, updates from volcanologists (brief and timely), information about precautions and evacuations (especially from disaster agencies), and links to webicorders and webcams. This information is especially important during periods of increased media attention leading up to and during an event. An excellent example is how the Alaska Volcano Observatory (AVO) (@alaska_avo) uses Twitter to quickly send updates on the changes to the alert status of Alaskan volcanoes (Fig. 1a). They also post images of the volcanoes that are linked back to their official sources (with credit) hosted on the AVO website (Fig. 1b). These tweets are clear and succinct, and they direct readers back to the original source of the material for more information. Most importantly, they are timely—typically tweeted within an hour of the change in status of the volcano. However, very few volcano observatories have Twitter accounts (Table 1). Those that have accounts vary their use from very active (posting multiple times a day or week) to inactive. However, even those that are inactive have significant numbers of followers looking for information. The accounts with the most followers are those not singularly dedicated to volcano monitoring, such Chile’s Oficina Nacional de Emergencia del Ministerio del Interior (@onemi—602,360 followers), United States Geological Survey (@usgs—424,310 followers), and Guatemala’s Coordinadora Nacional para la Reducción de Desastres (@conrdguatemala—227,139 followers). However, Ecuador’s Instituto Geofisico (@igecuador) and Costa Rica’s Observatorio Vulcanológico y Sismológico (@ovsicora_una) have over or nearly 100,000 followers. Interestingly, Latin American volcano monitoring agencies have embraced the use of Twitter the most, with active Twitter accounts for OVSICORI, IG Ecuador, Instituto Nacional de Sismología, Vulcanología, Meteorología e Hidrología (@insivumehgt), Servicio Geológico Colombia (@sgcol), Instituto Geofisico Peru (@igp_peru), and Proyecto Observación Villarrica Internet (@povi_cl). Adoption of Twitter as an avenue for public outreach and distribution of information in other parts of the world has been much slower, although both the Philippine Institute of Volcanology and Seismology (@phivolcs_dost) and Indonesia’s Pusat Vulkanologi dan Mitigasi Bencana Geologi (@vulkanologici_mbg) have recently become more active. In a study on the media response to the eruption of Iceland’s Eyjafjallajökull in 2010, Lee et al. (2012) posits that traditional media underutilised and under-reported the scientific information from the eruption in their coverage. Instead, they used sources from the travel industry for many of their reports due to a focus on the air travel disruption caused by the eruption. This lack of a scientific voice meant that the public reaction to the decision to close the airspace was heavily influenced by industry voices in the media rather than the scientific data and interpretations (Suw Charman-Anderson, pers. comm.). This situation could have been mitigated to some degree by use of social media, such as Twitter, for official sources to send timely and accurate information about the eruption directly to the public, rather than relying on more traditional and slower information distribution methods such as press releases and conferences. Additionally, misinformation during the eruption (such as the erroneous reporting of an eruption of Katla) could have been corrected faster if such information was released through official channels on Twitter rather than only adding a statement to the Iceland Meteorological Office (IMO) website (http://en.vedur.is) (Suw Charman-Anderson, pers. comm.). Another example is the recent eruption near Iceland’s Barðarbunga starting in August 2014. Information about the start of the eruption quickly spread on Twitter, but from unofficial sources such as the Icelandic media (e.g., @RUVfrettir) or non-volcano monitoring government agencies such as Iceland’s Department of Civil Protection and Emergency Management (@almannavarnir). This led to confusion about when the eruption actually occurred as there were reports of subglacial eruptions under Vatnajökull that ended up being unfounded. Official confirmation of the Barðarbunga eruption was not received until the IMO website was updated. The consequences of a subglacial versus subaerial eruption are very different from a hazard perspective, so clear information dissemination is vital. This confusion may have been avoided if IMO had been using an official Twitter account to disseminate this information directly to the public as soon as it was available. Posting to social media platforms can seem like an extraneous and unnecessary activity during a time of volcanic crisis. However, as the above-mentioned case studies highlight, there are real advantages to utilising social media as a tool to convey information quickly and directly. One key aspect to a volcano observatory’s use of social media is constant contact. Even when there are no volcanic crises, different audiences are looking for information. These audiences include (but are not limited to): local residents, tourists, students both near and far, researchers, news media, and government officials. Social media should be used to convey authoritative information about volcanic activity, as well as content on how to prevent/mitigate and prepare for, respond to and recover from a volcanic eruption (Fig. 2). Use it. Social media is a two-way dialogue to communicate and receive hazard and risk information. Traditional forms such as press releases or conferences allow for the mainstream media to add their agenda to the information. Social media platforms such as Twitter and Facebook cut out this middleman so that critical information is directly conveyed. Make it official. State in the account information that the social media account is official. This can add authority to the information released and stop confusion with people tweeting/posting volcanic information as enthusiasts rather than volcano monitoring officials. Twitter does “verify” accounts, but there is no way to request verification, so each observatory should state it clearly. This also means putting a direct link to the social media feeds on the main website as well, which adds authenticity and authority to the account. Post images and figures. The types of information most often sought out by the public are images of the eruption or figures of data (such as webicorder traces). Provide these in the social media feed, but be sure to stamp each figure with a date/time. This prevents older images or images of other volcanoes being distributed across social media platforms. Update volcano status information. If volcanoes are moved up or down in alert status, tweet/post a brief statement with this information, even if accompanying information is not ready. However, be sure to tweet/post a link to any additional information when it is ready as a lack of timely information reduces trust that the account is official. Remain active. Even if there is no on-going crisis, tweet/post information about volcanoes, images or links to webcams, new research or equipment installation. This allows for the public to know that work is being done between eruptions. Also, if the main website or Facebook page is updated, tweet/post about it and provide a link. Separate automated tweets. Some volcano monitoring agencies or observatories post automated tweets for events such as earthquakes. This information is valuable but can easily overwhelm a Twitter feed, especially in seismically active areas. Separate that information into a separate feed that is only used for tweeting seismic (or other) information, especially if it is automatically generated. Tweet/post links to press releases. If information is released as press releases, informational statements or if press conferences are webcast, tweet/post those links in a timely fashion. Sign off on observations and statements. If possible, direct observations and interpretations of events are very useful for the public, bloggers, and the media. If such information can be tweeted/posted, have the scientist “sign” the tweet/post with their initials [e.g., (EK)] so that verification can be made of the information. This helps add trust to the tweets/posts. Be aware of myths and, inaccurate views and reporting. If possible, observatories should monitor social media sites that provide information and/or discussion on an impending or on-going eruption as sometimes well-meaning people share inaccurate views or trolls purposefully offer false information. To counter these, observatories and/or disaster management agencies can post a FAQ (Frequently Asked Questions) Fact Sheet or Mythbusters Fact Sheet in an effort to dispel associated myths. Volcano observatories must decide how they can most efficiently and effectively disseminate their very important information on eruptions and unrest, let users know where, how, and what kinds of information is being posted, and then follow through with consistency. A statement on the observatories main page describing how they distribute the most up-to-date information (a social media use plan) would be a simple yet effective improvement. The icons for links to social media should be prominent if that is one of the main avenues they use to disseminate information to users. This approach does not lock in an observatory to follow a plan that may not work for them due to staffing issues, degraded internet service, lack of funds, etc. but gives flexibility to change and grow, as long as they communicate those changes in a social media use plan. There is no doubt that a large proportion of the general public has embraced social media and expects to have the ability to communicate information via its various sources. Significantly, social media are two-way communication tools allowing official agencies to rapidly interact with the public and each other in real-time. Social media platforms offer a creative alternative to traditional media (e.g. radio, television) for communicating risk information. They allow volcano observatories to share knowledge and experience of events, and promote through stories, photographs, and videos the utility of volcano monitoring, even during periods of quiescence. As such, social media can be used to generate continued public interest and trust, whether or not an eruption is imminent. The case studies shown here demonstrate the high demand for accurate and timely volcanic information during a crisis, both pragmatically (for people living nearby) or to satisfy curiosity. Social media such as Twitter can meet those demands as part of an overarching communication strategy. However, Twitter should not be the only social media instrument used and other more traditional forms of media should not be replaced with social media. Overall, social media should be embraced as an additional way to directly communicate with the general public and complement existing strategies. In order to ensure that they remain relevant, however, volcano observatories will have to keep up with the most prominent trends as Twitter and Facebook may be replaced by other platforms in the future. Open Access This chapter is distributed under the terms of the Creative Commons Attribution-NonCommercial 4.0 License (http://creativecommons.org/licenses/by-nc/4.0/), which permits any noncommercial use, duplication, adaptation, distribution, and reproduction in any medium or format, as long as you give appropriate credit to the original author(s) and the source, a link is provided to the Creative Commons license, and any changes made are indicated. The images or other third party material in this chapter are included in the work’s Creative Commons license, unless indicated otherwise in the credit line; if such material is not included in the work’s Creative Commons license and the respective action is not permitted by statutory regulation, users will need to obtain permission from the license holder to duplicate, adapt, or reproduce the material.